Underground Time is a difficult book to read. I found myself setting it down, time and time again, telling myself I wouldn’t pick it back up because there was enough depression in life without needing to read about it in a book too. When I did, inevitably, pick it up, I found myself reciting, “It’s just a book, it’s just a book, it’s not real life, don’t let it get to you, their story isn’t your own,” over and over again. Delphine de Vigan, however, makes her character’s stories my own; makes their pain so palpable and sharp that it aches my heart. And, after finishing this book, it is all I can do to not bury myself under the covers and lay there, warm and satisfied, unwilling to face the harsh realities of life. I owe it to this book and these characters, which have become so real to me, to persevere on, at least for a little while more. What makes de Vigan such a brilliant author is her prose. Even in the first novel I read of hers, No and Me, I was blown away by the subtle beauty of her writing, the manner in which her phrases were thought-provoking and contemplative, all while retaining an ethereal loveliness about them. Thus, when I heard that de Vigan had written just one other adult book that had been translated into English, I rushed to my library to make them order it, just for me. Underground Time, though, is far different than No and Me was. Where her young adult story is a coming of age story full of silver linings despite the fact that it acknowledges that certain aspects of life simply cannot be changed, Underground Time is a story of two depressed adults for whom life has simply pressed down upon, much like the sky pressed down upon Atlas, the Titan. Underground Time charts the story of Mathilde, a single mother of three children who is the victim of corporate bullying. After gently disagreeing with a minor point her boss made, Mathilde has found herself slowly spiraling away from all she loved about her job. Over the past eight months, her boss finds every reason to criticize her and turn her co-workers against her, all while lying about receiving important documents until, finally, on May 20th, Mathilde is replaced. Thibault, who shares the dual third-person narration in this story, is a doctor who is caught in a relationship of unrequited love. Finally, he finds it within himself to end his relationship for giving love and receiving none in return is every bit as painful as it sounds. Underground Time is a story that takes place over one day, filled with contemplation, longing, and flashbacks, detailing the joint story of Thibault and Mathilde, strangers who don’t know each other, but whose lives contain similar threads of depression and loneliness. Underground Time takes place over the span of just one day, which is why it tends to drag a little after the half-way point, Mathilde and Thibault having the same depressing thoughts, only expressing them in a slightly different manner. Yet, despite this, the novel is surprisingly readable. Mathilde and Thibault both have their own individual voices which only complement each other. Although both our main characters do not know one another, it is evident from their narration that they should know each other for both of them want similar things from life. For me, the story of Mathilde and her heart-wrenching corporate discrimination seemed to be the overarching story arc that the tale of Thibault only enhanced. As a doctor, Thibault travels the city of Paris, meeting dozens of people with their own problems and depressions. In many ways, Underground Time is equally a story of the city as it is of Mathilde and Thibault. It seems as if everyone in the city, despite being so occupied with their own lives, are eventually going to reach that point of exhaustion in their life, in some way or the other. With Thibault, we can see so clearly the multi-faceted side to this city, one teeming with life and death in equal parts. Furthermore, an advantage of having the narration of Thibault told side-by-side with that of Mathilde is that we can see so clearly the cruel game that fate plays with them both. As with any dual narration, one always expects the characters to meet and while that standard is no different with this novel, it is a patient process. It seems as if, many times, Thibault and Mathilde are just about to meet one another, purely by coincidence, when, at the last instant, they just miss one another. Underground Time, unlike what I expected when I cracked open the spine of this novel, is not a romance. Instead, it is a story of two people who are forced to make tough decisions in their life, whether it is ending a relationship that isn’t working out or coming to the end of an unhappy time in an office building. Yet, what I love about this is that these actions are neither good nor bad decisions. Instead, they are inevitable. At times, life backs us into a corner where we have no choice but one left before us. Furthermore, this is a story not of the hope of a new and better life, but rather of the forlorn and hopeless period in-between; before one feels that life can better, they must first feel as if it cannot. All in all, Underground Time is a novel that I know many of my friends will enjoy but it is, in equal parts, a novel I know many of my friends will despise. It is achingly real, to the point where one is compelled only to read stories of happiness afterwards, but it’s worth it. 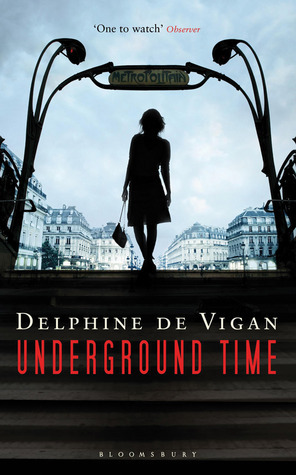 Delphine de Vigan has, yet again, managed to write a novel that is unique, thought-provoking, and shockingly realistic. While I do believe the ending is conclusive enough, I know many readers who have felt otherwise for, truly, it is open and ambiguous like few things in this world are. Yet, I found it was the perfect ending, both for this novel and its characters. It was fitting, in a way only life, which continues to go on despite everything it throws at is, manages to be. A Face Like Glass tells the tale of Caverna, an underground city, much like Alice's Wonderland. In Caverna, babies are born with the inability to show their emotions on their face and, as such, are taught how to mold their faces into expressions by wearing masks. If that wasn't strange enough, Caverna is a land of magic - although it is never seen as magical - for the wines can erase your memories, cheeses can help you see the future, and perfumes can command your thoughts. Into this world is thrown Neverfell, a girl whose every thought is shown visibly on her face. As such, she is a threat to those in Caverna who fear the honesty of her gaze but also seek to exploit her innocence. Neverfell is first apprenticed to Master Grandible, a renowned cheese-maker who hides away in tunnels to escape the ruthless politics of the Court. When Neverfell chases a white rabbit, with the original intent of bringing it back to her master, she stumbles into the world of Cavera and from there, her journey is every bit as crazy as can be imagined. I hardly know where to start when it comes to Hardinge's spectacular novel. 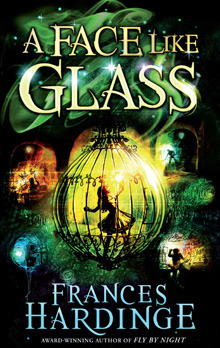 For one, let me assure you that it blew me away and, despite being a Middle Grade Fantasy novel, I found that it was every bit as thought-provoking and intelligent as YA and Adult reads, if not better because of its subtleties, cleverness, and surprising plot twists. Caverna is a city with secrets, a cavernous tunnel that changes ever-so-slowly and calmly watches over the people in her kingdom, all of whom are pawns in a giant game of politics. Whether it be the powerful families who make the delicacies of Caverna and battle amongst each other in a quest for power or the Grand Steward, the ruler himself who has transformed himself in such a way that one eye is always open, always watching for betrayal, Caverna is a land where no one is safe. Into this world is thrown Neverfell, a naive and innocent child after having been sheltered by Master Grandible, away from the deceitful society of Caverna, all her life. At first, the people of Caverna are unsure whether to be terrified of the raw honesty in Neverfell's face or simply use her to exploit their own malicious intent. As such, as she passed around in this game of Court from powerful families to powerful leaders to powerful enemies. Although Neverfell is initially very trusting of everyone, including strangers she meets, her resolve, good will, and resilient nature make her an engaging heroine, not an irritating one. Furthermore, as the novel wears on, her growth is gradual, both as a person and as a player in the game she has been unwillingly thrown into. While Neverfell remains the most fleshed-out of all the characters in this novel, nearly every character in this tale becomes well-developed with the progression of this tale and, best of all, the villains aren't all black-and-white, but rather multiple entities of grey. In fact, seeing this world through the eyes of Neverfell, it is difficult to be sure, at times, if friends are truly enemies and enemies are truly friends. In the midst of this political intrigue, Neverfell slowly comes to realize who she is. It is evident that she is not a citizen of Caverna but rather of the outside world where, rumor has it, the sun burns off your skin. As Neverfell has no memory of her childhood, of how she came to be in Caverna, this intriguing tale of political mystery is in equal parts a gentle story of growing up, of becoming the person you can be when circumstance forces you into dark corners. It seems like a very dark tale at times, but rest assured that Hardinge always keeps the silver lining just within reach. Now, how else can I possibly express my love for this story? It does lag a bit in the middle as the climax of the story approaches, but either than that small flaw, it is very nearly perfect in every way. Once immersed into the world Hardinge has created, you won't want to come out and, when you do, you'll most likely realize that you've gone just a little mad while in Caverna yourself. A Face Like Glass is such a multi-faceted tale, forcing you, as the reader, to not only join in on a world full of lies, but also to question the lies in our own every-day lives. Even more than that, though, it is a tale of revolution and of flying free from control and power, whether it be in terms of social class or just escaping from the tight web of lies that this underground city runs on. Either way, you can read A Face Like Glass with one surefire thought - you will emerge from it changed, reflective, and itching for more of Hardinge's writing, even if it means walking into the children's section of your library. Reviewer's Note: It should be known that I am absolutely terrible at writing reviews for books I love. I hardly know if what I've written here makes sense, so allow me to direct you to the review of one who constantly humbles me with her prose. Catie, at the Readventurer, convinced me to pick this up with her review and, without a doubt, she will convince the rest of you as well. I cannot recommend her review enough. I suppose, in many ways, I didn't give The Cadet of Tildor much of a chance. I painstakingly read through the first quarter of this book before giving into my desire to skim the pages until I was nearly half-way through the novel and began to realize I was well and truly wasting my time. The Cadet of Tildor is not a bad novel, but it just wasn't one for me. As a high fantasy junkie who has grown up reading Lord of the Rings, Harry Potter, Tamora Pierce, Kristin Cashore, and Megan Whalen Turner, Alex Lidell falls seriously short of other fantasy writers of this age. The Cadet of Tildor starts out strongly enough, introducing us to a fierce and strong-willed protagonist, Renee. While I instantly admired her for standing up to her father and willing to follow her dreams of completing her training as a Cadet, despite the fact that she was up against stronger men, I was unable to feel much of a connection with her as the novel wore on. From the onset, her friends were flat and two-dimensional and the revered trainer seemed to lack personality as well. Or, perhaps, they didn't lack personality and it was just the fact that they were so like every other fantasy character out there that I was unimpressed. The Cadet of Tildor is excruciatingly unoriginal and, upon skipping to the end, I can already inform you that its last line is the exact same last line from Turner's King of Attolia, only without a complex situation and three novels to back it up. In addition to my lack of feeling for the characters, I simply felt very underwhelmed. Nothing much happens during the beginning and neither are the characters or world set up in a manner I found to be interesting. In fact, I virtually have no grasp of this world or its politics whatsoever. 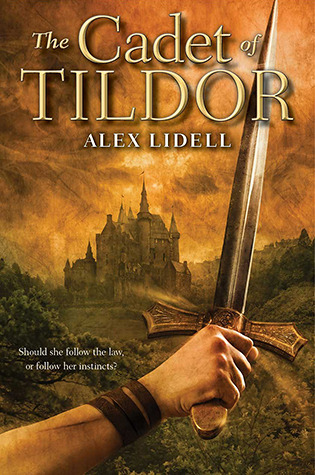 Ultimately, Lidell's debut is a disappointment for me simply because I go into fantasy expecting more from it and this one just didn't live up. 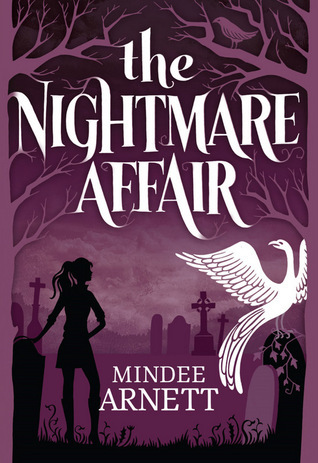 Unlike the contemporary genre, which often lets me down and I've come to accept as a hit-or-miss genre for me, fantasy usually never fails to amaze me, but the recent revival of YA Fantasy certainly has. For newcomers into fantasy or those of you who are unfamiliar with the works of Megan Whalen Turner or Tamora Pierce, The Cadet of Tildor is likely to take your breath away. It is extremely well-written and the words flow smoothly from the page, proving that Lidell can, indeed, write. Yet, when compared to other fantasy works, it falls short of a masterpiece by far. Of course, the novel may drastically improve, but as I already feel nothing for the characters, I sincerely doubt I'll enjoy this one too much more. 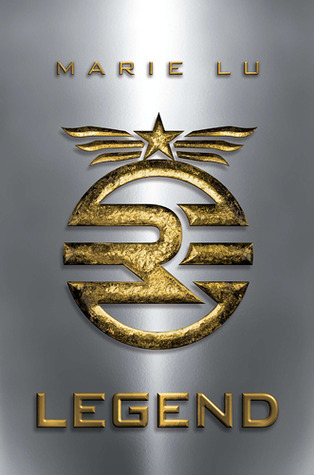 Legend is one of those books that simply demands to be read, not so much because of its original premises, intriguing characters, or fast-paced plot, but rather because everyone seems to have such a varied opinion about it. I always make it a point to read the reviews of my most trusted reviewers - those whose opinions are similar to my own - but when it came to this book, the ratings ranged from amazement, to indifference, to like, to hate. Thus, I knew I had to read this and give it a shot for myself to see what the hype really is all about. 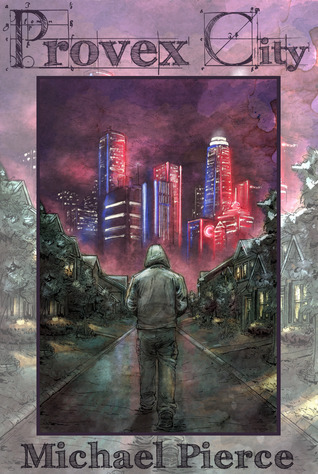 Well, if you're anything like me and if you've read your fair share of dystopians, I can tell you now thatLegend offers nothing new to this over-wrought genre and, frankly speaking, you aren't missing much if you skip it. If, however, you're nothing like me (or you're just wondering why I couldn't finish one of your favorite books), you might as well stick around. I doubt it'll be a long haul anyway. See, the thing about Legend is that it is exactly like every other post-apocalyptic novel out there. We have our utopian-like society, we have two vastly different characters, we have the slow uncovering of betrayal, that all is not as perfect as it seems. Very, very typical. Now, it isn't that I have an aversion to typical plots - because everyone knows I read more than just a few dystopian series - but the qualities that I needed to make this novel interesting, engaging, and something worth reading were simply lacking. Well, that and I suspect I'm growing tired of this genre...is there really anything new left to explore? 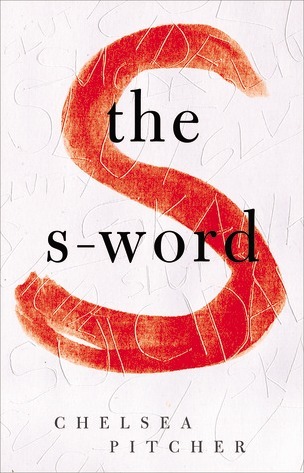 In addition to the utter lack of characterization, the world-building in this novel was nothing new and I was unable to form much of a connection with the characters. Day, to some extent, is an easier person to get to know, merely because he has feeling. June, however, is distant from everyone but her older brother, who, once dead, makes her just plain unfeeling. So, really, can you blame me for not wanting to continue this? Unoriginal plot lines, characters that lacked distinct personalities, and an attachment that failed to occur. By the time I passed the half-way point of this story, I was done. I can't even say that Marie Lu is a good writer because, really, her writing was nothing special either.Legend is a tiny bit better than Article 5, but not a whole lot much. In fact, Enclave, another DNF for me, is far better, so maybe check that out instead? Or, you know, just give this a shot, because even if it's not for you, it's a quick read and you won't feel as if you wasted your time. At least, not too much. Looking back, I think I can acknowledge that The Mad Scientist's Daughter is more of a tragic love story than anything else. Although it's been marketed as sci-fi, focusing on robots and a dystopian future that seems eerily similar to something our own children may experience, at the core, it is all romance and not much else. Let me clarify - all dramatic and angst-riddenromance. Unfortunately, I didn't even feel much for this main romance since I was too preoccupied coming up with ways to murder the main character, Cat. 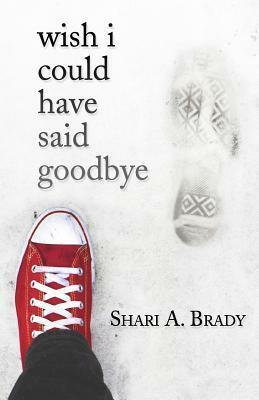 I feel like an anomaly, simply because everyone seems to have at least liked this story, if not loved it, but I was literally crying tears of happiness as I neared the end. I suppose, though, that at the end of the day, some books aren't for everyone and this one just wasn't for me. I will say, however, that Clarke has some of the worst synopsis writers ever. Seriously, the synopsis for The Assassin's Curse gave away the entire plot and the synopsis for this one gives away too little. Ultimately, however, the novel is about, as its title suggests, Cat, the daughter of famed scientist Daniel Novak. When Dr. Novak brings Finn, a robot who looks and seems human in every way, to their home when Cat is only five, her entire life is changed. At first, their relationship is one of tender friendship. Cat is tutored by Finn, but as she grows, so do her feelings for him. Nevertheless, the fact remains that Finn isn't human, he's only a robot, so he can't possibly feel anything for her too...can he? I found the premises of this novel to be fascinating and was quickly drawn into the story of Cat as her life unfolds, from childhood to adolescence to adulthood. Yet, as I finished the first part of this novel, for it is split into three parts, I couldn't help but lose my former enthusiasm for the story. For one, the novel justdrags. It covers nearly half of the total lifespan that Cat lives and as such, it is a long book, one with lots of extraneous details and under-developed secondary characters that it is impossible to feel much for because of their fleeting presence, giving way to more than a little skipping. More important, however, Cat is an unlikable character like no other; unlikable to the point where she's quite literally a badperson, not someone who is good and has their flaws. As Cat grows and continues to deny her feelings for Finn, treating him as a robot while seeing him as a man, she uses him in more ways than one; uses him as an object, never bothering to care for his feelings and exploiting him for her own gain, despite her care for him. Later, in an effort to escape her attachment to him, she uses other men in her life, for instance her rich husband whose love she never returns. It's all just one disaster after another; death followed by a loveless marriage followed by more sorrow. If all that desolation wasn't enough to turn me away, I never felt as if Cat was truly redeemed by the end - I still hated her with a passion. Now, books, as John Green would say, are not in the business of creating likable characters, which I totally understand, but I do believe that they are in the business of creating bonds with a reader and that was sadly missing. Of all the characters in this tale, the only one I came to feel for was Finn; sweet, kind Finn who seemed to be utterly manipulated by everyone in his life, from Cat's kind father to Cat, who loved him, herself. Furthermore, more than a lack of emotion or feeling when it came to this book, there were so many aspects of Cat's life that we found out about, but that played no larger role overall; I guess that the plot outline was generally very sloppy for this, introducing elements that were completely unnecessary and leaving me detached even from the story itself. Yet, even more than the characters and my dislike of the romance, this book sorely disappointed me with all its wasted potential. At times, the novel would veer towards political debates on the humanity of these robots, whether or not they should have been granted rights, etc., but none of this was further explored. Furthermore, Cat never undergoes any doubt or lingering qualms before entering into a relationship - or whatever you want to call it - with Finn. Of course, she realizes that it isn't normal or evenright to be in love with a computer, but she doesn't seem to care or worry. In fact, the only character who ever calls out Cat on her relationship with Finn is her mother, who is conveniently killed off in the first third of the novel. 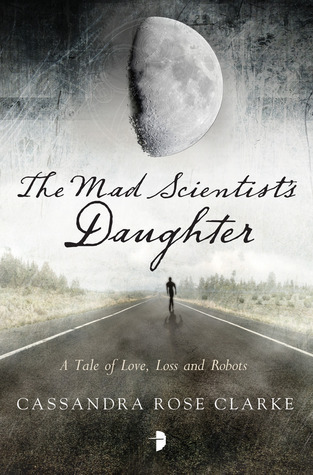 While The Mad Scientist's Daughter was not a book for me, I'm sure it will move many other readers. I'm not one for angsty romances that remind me of the majority of adult romances that I so painstakingly avoid and especially not with hints of politics and sci-fi thrown in thrown in for the sake of it; I'm especially not one to condone heroines who use men in a twisted love triangle fashion, giving the type of love that is seen as practically obsessive for they are a mere shell of themselves without their loved one. I cannot deny that Clarke is a phenomenal writer and her versatility has definitely shown through in her quick - and successful - venture into adult novels. Still, I think I'll just stick with her YA books - God knows I can't wait for The Pirate's Wish to release! Thank you to NetGalley and Angry Robot/Strange Chemistry for providing me with a copy of this book in exchange for an honest review. 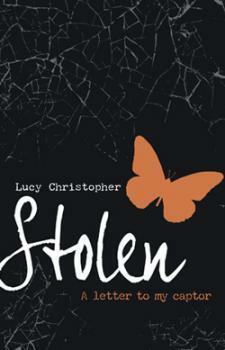 Stolen isn't a romance and for 90% of the novel, Gemma is constantly trying to run away from Ty, to escape her predicament. Yet, somewhere, she realizes that some of what Ty says is true; society is terrible and cruel and parents really don'tunderstand their children and sometimes even friends don't and terrible things do happen. But, that gene that tells you in your brain that you have to accept the bad things and move on, that you can't save everyone, that maybe even you can't save yourself...it wasn't in Ty. Yes, Ty steals Gemma, but he steals her because he thinks he's doing the right thing. 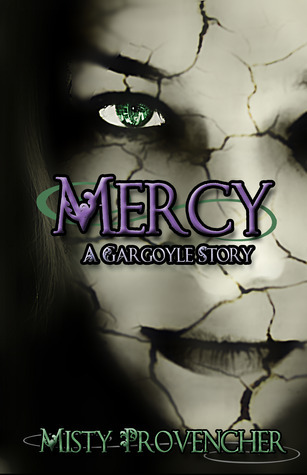 Unknowingly, Gemma saves him as a child and he wants to return the favor. It's so mind-boggling because Ty isn't a bad person; he's nice to Gemma, he never harms her or takes advantage of her in any way, he clothes her and feeds her and shows her the beauty of the desert; but he's wrong in his own right, too. If the breathtaking cover of Hold Still hasn’t already captured your attention, the beautiful writing inside certainly will. LaCour’s debut is an ambitious piece, taking on grief, confusion, and the swirling unknown of despair that leads to teenage suicide. While I can’t say that this is an easy read, because the sadness in it is practically overwhelming, it is a very well-written and powerful novel, one that every lover of moving prose, three-dimensional characters, and realistic approaches should invest their time in. When our novel begins, Ingrid, Caitlin’s best friend, has just committed suicide. Needless to say, the entirety of this novel is Caitlin’s journey as she learns to move on and continue living, despite the gaping hole in her heart. Now, I’ve read my fair share of grief novels and, from my experience, they usually involve road trips, hot guys, or just escaping. As much as I enjoy and simply love those books, Hold Still is a far more real experience because, admit it, as a teen, what are the chances of you taking off in a truck across the country with a ridiculously hot guy, too? Zero. Thus, I found Caitlin’s journey, although far more depressing than I originally anticipated, being a much more realistic portrayal of teen grief. In my eyes, the strength of this novel lies in Caitlin. LaCour gives Caitlin many tools; she allows her to find Ingrid’s journal, full of her deepest thoughts; she allows her to make a new friend in school, one who has also experienced loss; she gives her understanding parents who only want to see their daughter emerge from her numb stasis; and she even gives her a concerned classmate, one who wants the best for her. Yet, despite all these people willing to help Caitlin and the objects of Ingrid’s that she finds to help her understand her friend, they all somehow play a very minimal role in the novel. Instead, this book is all Caitlin, all her interpretations of Ingrid’s short journal entries, all her confused feelings and bad moods, all her slowly coping with this unexplainable grief. Caitlin isn’t an easy character to like. For one, she’s closed off from others, her narration is deeply saddening, and she pushes away others. Yet, her growth throughout the novel is gradual and evident, which I loved. Perhaps best of all, for the reader at least, is that the grief that Caitlin feels, the same grief that seems to be pressing down upon us as we flip the pages, choking our words and enveloping us in darkness, recedes. LaCour is such a brilliant author that, truly, I was so very numb while reading the first half of this, but, like Caitlin herself, I slowly began to thaw. Even more than her prose, LaCour’s depiction of teens, the conversations Caitlin carries with her parents and her photography teacher, her blooming romance with the school’s most popular guy…it’s all so very believable. Ultimately, I cannot recommend this novel enough. I am still blown away by the depth of some of the relationships in this story, the truly individual arc of growth, and just Caitlin herself. I feel like I’ve crawled into her skin since I know her so well, her passion for photography and to make a tree house, her parents, her friends, her worries, her aspirations, her heart… Hold Still is a contemporary that just cannot be missed. 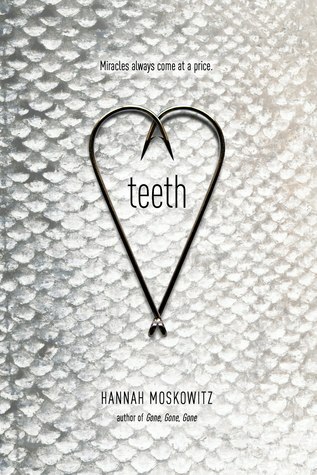 It is deep, lovely, and moving in all the right ways and will undoubtedly change your expectations about teenage contemporary novels for sure. Nearly a decade ago, someone once told me that books are like memories; within their pages, they store your emotions and thoughts, a document of sorts of your experience. I still don’t know how true that statement is, but I dearly hope it is – at least when it comes to Just One Day. Nothing better than this book itself can summon up the whirlwind of emotion I felt when I read it. Although I cracked open its spine with trepidation – there are, after all, a plethora of mixed reviews out there – my feelings quickly changed from that of anxiety to excitement as I was swept up alongside Allyson on her breathtaking journey. At one point, I wasn’t sure if I was laughing or crying for I was so full of giddy happiness and bittersweet longing - those are the types of feelings a Gayle Forman novel inspires in you. I finished Just One Day with a smile on my face, my heart swelling with pride for Allyson, who felt as close to me as my own best friend, and although the pang I feel when I think of this novel is only an echo of what I feel for Forman’s If I Stay and Where She Went duo, I still love it, albeit in an entirely different way. 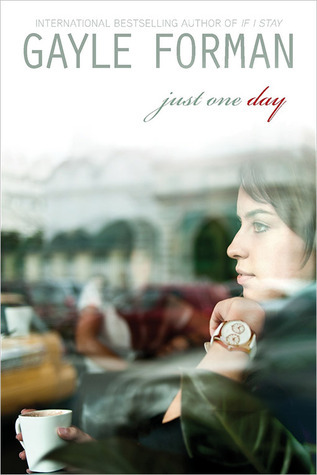 Just One Day is a novel that will very easily either captivate or disappoint readers. It’s a New Adult novel that almost demands that you be a teenager to truly understand it, for Allyson’s journey is such a personal and nostalgic experience, one that everyone can definitely relate to. One of the best ways I can find to summarize it is a realistic rendition of Kristen Hubbard’s Wanderlove. Although Wanderlove is one of my favorite books of all time, I can’t deny that the chances of traveling to a new country and finding a hitchhiker to explore with are rather low. Thus, Allyson’s summer experience in Europe, a disappointing one full of touristy stops and not enough life is easier to relate to. When Willem, an enigmatic Dutch actor who Allyson sees performing Shakespeare in London, offers to take her around Paris – for just one day – she agrees, despite her goody-two-shoes attitude. What follows is a day of whirlwind journey; it isn’t perfect, but it’s real and it’s far more rewarding than any other trip on Allyson’s summer vacation. Perhaps best of all, to Allyson at least, is that she is no longer Allyson, the girl who listens to her parents, studies hard, and never lives life the way so many other teens do; now, she’s “Lulu”, a nickname Willem gives her, and as “Lulu,” Allyson is finally free to let loose the person she truly is inside. Nevertheless, her exhilarating journey is abruptly halted when, the next morning, Willem is gone. Now, Allyson is distraught, both at thinking that Willem may have just used her and at contemplating her life in college as a pre-med student – a path that her mother, not her, wants to follow. As Allyson will learn, however, her day in Paris wasn’t about Willem at all – it was about her and finding out that she was more than she – or anyone else – ever quite imagined. Just One Day, as I’m sure countless reviews have stated, is a journey of self-discovery. Although I will admit that it isn’t wholly original, it is certainly memorable. Allyson has a certain vulnerability about her that makes her impossible not to love. In Paris, she may have been pretending to be “Lulu”, but that was who she really was and she struggles to find a way to be that person again, all while continuing to please her parents and hold onto her childhood best friend, Melanie, who constantly reinvents herself. One of my favorite aspects of this tale was the subtle heartbreak that came not only with seeing Allyson and Melanie grow apart, but also Allyson and her parents. In their place, however, Allyson makes new friends, never replacing those from her past, but simply realizing that growing up also means leaving room for new people to join her life, such as Dee, the African American boy she meets in her “Shakespeare Out Loud” class; the person who shows her that although she has many personas – “Lulu”, pre-med student Allyson, reliable Allyson – who she really is is a mixture of all the roles she plays, and still so much more. In my eyes, what makes Just One Day such a hit-or-miss novel is the mere fact that Allyson is a character trying to find her place in the world. After her trip to Paris, she comes to the stark realization that no one really sees her – not her parents, not her best friends, no one – except for Willem. Willem, who took a bargain in spending a day with her, unknowingly changed her entire life, not just because of who he was, but in what he brought out inside her. 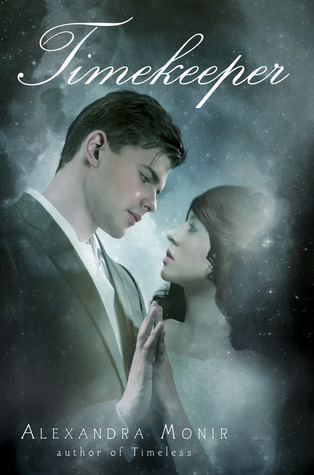 What I loved about this story was that Allyson found herself again - finds herself again – and this time, without Willem. It is this journey, this third journey almost; the first being her wake-up call, the second being her slow emergence from the typical life she leads that isn’t really hers, to this now final journey of finding who she is all through her own experience, her own friends, her own interests, and her own initiatives. It’s beautiful. Nevertheless, I will admit that Just One Day is not a perfect story. For one, some secondary characters, such as Allyson’s father, are astonishingly underdeveloped, lacking personality when surrounded by such well-fleshed out characters. 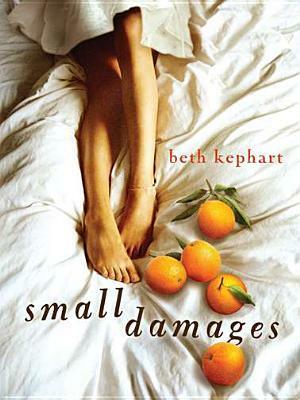 Furthermore, this novel failed to impact me on an emotional level equal to that of If I Stay or Where She Went. I can’t really pinpoint what it is that made this novel fall for me, but a certain aura or fully nuanced aspect of Allyson, perhaps, was missing. Unlike other readers, however, I was never bothered by the mysterious figure that Willem remained throughout the novel. If anything, I loved the way he was portrayed in this book – a traveler, a lonely young man, a player…or someone who we’ve all just judged too quickly, because, perhaps, there’s more to him and his story than what we see before our eyes. Yet, what I liked best was that he didn’t reappear in this story – once he left, he was gone and then it was all Allyson and the manner in which she came to terms with who he was and what he did for her, changing her life, was remarkable. 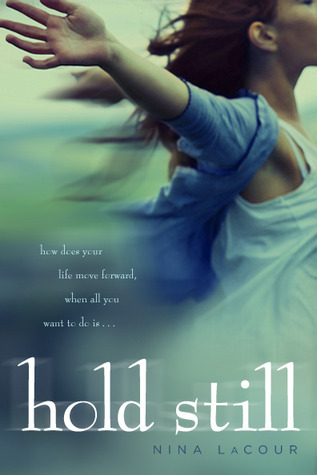 Just One Day is a novel that just must be read. It is beautifully written and to see Forman take on something different – the idea of living truly and happily instead of the idea of choosing between life and death – was refreshing. Of course, there are many authors who have written self-discovery novels in the past, and I have liked some of them more than this one, but Forman’s tales just never leave my head. I was thinking about this the whole day, ever since I finished it last night (at 11:54, which means I actually read Just One Day in exactly a day! ), and I am still convinced that I have not extracted the full depth and meaning that this story has to offer. It’s a universal tale, one that will transport you to other countries, make you feel emotions you thought you could never feel, and ultimately, just as it changed Allyson, it will change a small particle of you too. 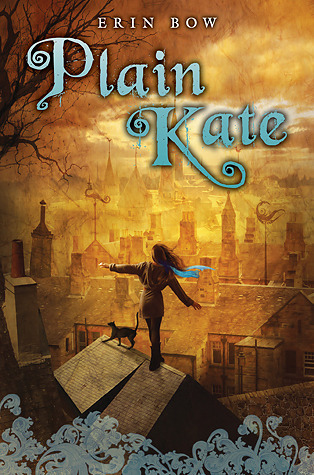 Plain Kate is, quite honestly, just not the book for me. I know a countless number of my friends and most trusted reviewers have absolutely adored this tale, but despite being an ardent fantasy lover, I somehow could not get into it. Bow's debut follows the tale of Plain Kate, a tale of woe for every time something bad happens to her, something worse is waiting just around the corner. Kate is orphaned at a young age and after her father's age, she struggles to survive in their town where everyone believes she is a witch. When Linay, an evil albino wizard, comes to town, he offers her a wish and whatever provisions she may want in exchange for her shadow. Kate, not knowing the seriousness of this bargain, agrees, only to have her life take a turn for the worse - yet again. 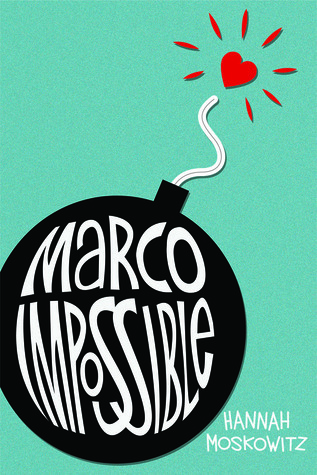 While many readers found this story to be vastly intriguing, I thought it was rather boring. In fact, the first hundred or so pages can probably be skimmed entirely since nothing much happens. Furthermore, the writing that so captivated others rendered me unable to connect with any of the characters. It made me feel aloof and distant from the story itself and while beautiful to be sure, I didn't enjoy it and felt it didn't work well with the novel. Perhaps my biggest qualm, however, is Kate herself. Throughout the novel, Kate only becomes tougher and stronger, but her experiences never truly change her or make her orient herself and her life in different directions. In addition, as I mentioned before, I was unable to connect with her and feel much but sympathy for her life. 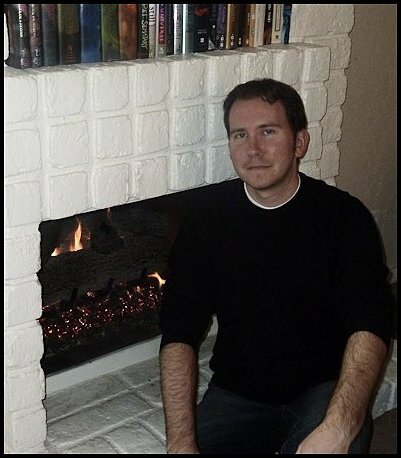 Overall, Plain Kate isn't a novel I can recommend, but it is one I advise any fantasy reader to give a chance. I am in the minority when it comes to this piece and can only hope that other readers love it unlike I have. Nevertheless, I will admit that if Erin Bow decides to write a young adult fantasy novel next, one that is a little more sophisticated and with older characters, I'll be itching to get my hands on it for sure. 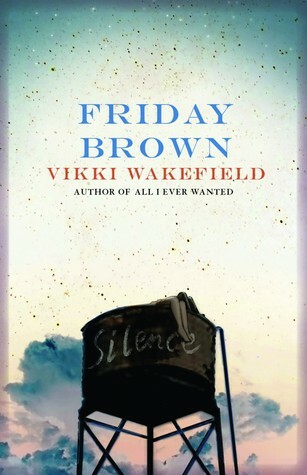 Bow is an author whose works I am bound to love - I can just feel it.